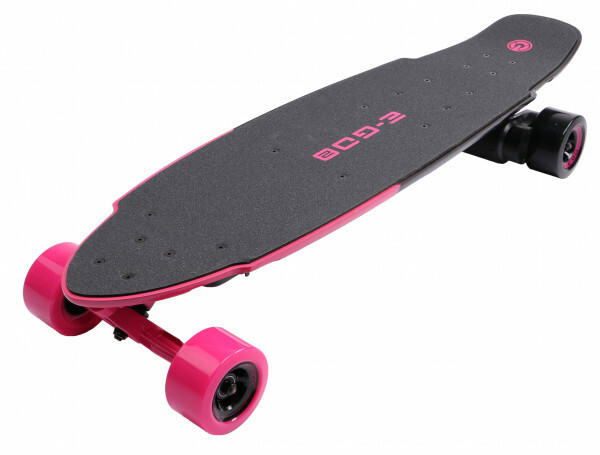 Product information "E-GO 2 E-Board, Hot Pink (UK Version)"
Featuring a 12-mm, eight-layered composite wood deck to make it flexible and durable, two riding and speed modes to accommodate any rider, and a 400-watt motor, the E-GO2 possesses all of the qualities you're looking for in an electric longboard. The new stylish E-GO 2 kicktail shape gives you more control and better steering, and let you keep pace with the latest trends. The E-GO 2 is the ideal way to get around every day, because it’s easily transportable and weighs only 6.3 kg. The axes of the E-GO 2 are made of highest quality materials and allow the E-GO 2 to continuously adjust to changes in hardness. The ball-bearing rollers are smooth-running and low-wear. Please respect the local laws and check if a ride is allowed at the place you want to drive. IMPORTANT: Please note that this item can only be delivered to mainland Europe for logistical reasons (does not apply to UK / Ireland)! Related Links "E-GO 2 E-Board, Hot Pink (UK Version)"